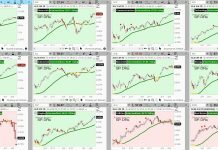 Stock market trends remain bullish, though last Fridays decline was sufficient to put some “Wear and Tear” into momentum and breadth. This is likely the beginning of a topping process for the equity market in the near-term. While this doesn’t preclude Equities moving higher this week to end the month and quarter, it does mean that upside likely will prove limited in all likelihood. We may also finally see some evidence of selling pressure in April after 3 sharp months of rally. Treasuries moved sharply higher with yields now down to 2.41% in the 10year and dropping under the 3-month yield for the first time since 2007. Readers might remember this happened back in 2006 about a full year ahead of the crisis and was something to keep note of. Meanwhile the Dollar has temporarily stabilized and bounced in recent days, but Gold has managed to push higher anyhow. It’s thought that Dollar strength likely proves temporary into April before turning back down, and Gold might begin to finally make a move towards the more important 1375 area of “neckline” resistance. Defensive sectors gained ground last week as Technology showed some meaningful reversal signs right near former highs. Looking back… Equities showed their first ~2% decline since the end of December as prices fell sharply with six sectors falling more than 2% and breadth finishing down around 3.5/1 negative. That’s a big change from the kind of price action and sector performance we’ve seen lately. However, it’s worth noting that given the extent of Thursday’s gains, Friday only finished down around 3 points under Thursday’s lows. However, with Tech having gotten to right near prior highs, it’s thought that Tech likely cannot rebound too meaningfully in the weeks ahead before consolidation. What’s considered a real negative, is the extent to which Treasury yields are dropping precipitously. The bond market seems to have lost any sense of confidence for US economic growth. As for positives, structure is still in OK shape, and we’ve seen a heck of a rally the first few months, which tend to be positive for the year historically. Additionally, sentiment is a bit subdued, and Demark Exhaustion is still EARLY to form, and will require a move back to test highs. 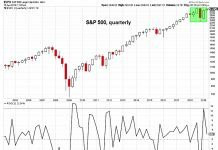 Overall… The base case is that last Friday was potentially a tipping point for momentum and breadth , but yet we’ll see signs of prices trying to claw back this coming week to help the quarter finish out on a good note. Market breadth, however, is unlikely to match on the Upside what it did on the downside last Friday. Thus, we still face a troubling situation heading into April in the short run that likely means at least a minor pullback is going to begin in April. However, it’s thought that this won’t erase even 50% of the move up from December and should turn out to still be a buying opportunity for stocks in the months ahead. 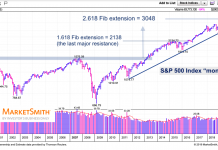 As has been mentioned, it’s still likely that the brunt of any real selling could be pushed off until the Fall and certainly next year likely is setting up to be Sub-par, both technically and economically. For now, we’ll use last week’s Friday dip to try to buy for a push higher this week.